Fun Fun is an acquired taste for me: in the Eighties I hated their simple dance tunes, now there's a bit of nostalgia and the realization that much of today's music is much worse than that. 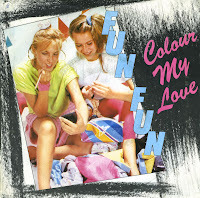 The hit 'Colour my love' was an international smash hit. It reached number 10 in the Dutch Top 40 and also charted in most of Europe. Fun Fun are the Italian singers Francesca Merola and Roberta Servelli. They made themselves famous with their early Eighties blend of dance music and simple pop songs. Their first hit single was 1983's 'Happy station', which was remixed in a so-called 'scratch version' to appeal to the youth market at the time. The single reached number 4 in the Dutch Top 40 and number 11 in Germany.